The US is “evaluating” its policy towards Israel in the wake of Benjamin Netanyahu’s re-election and campaign statements. This could involve passing a UN resolution condemning Israeli settlements. The president also brought up Netanyahu’s campaign comment about Israeli Arabs, a White House official told Reuters. Angered by PM Netanyahu's statement against Palestinian statehood, Washington is now ready to re-access its options in US-Israeli relations. The warning came directly from President Obama to his counterpart in the phone call, and was later explained by the White House. "Our policy decisions need to be reconsidered - and that's what we will do," the White House press-secretary Josh Earnest said at a briefing. During the election, Netanyahu accused his opponents of busing Israeli Arabs to the polls “in droves.” The White House condemned the comments as “cynical, divisive election-day tactics” that “erode the values critical to the bond between” the US and Israel, spokesman Josh Earnest told reporters Thursday. Earnest characterized Netanyahu’s campaign promise to block Palestinian statehood as “walking back” from Israel’s commitments to a policy that enjoyed bipartisan support in the US, and formed a basis for US actions on behalf of Israel in the UN and elsewhere. The White House spokesman was echoing the statement of his State Department colleague. “Based on the prime minister’s comments, the United States is in a position going forward where we will be evaluating our approach with regard to how best to achieve a two-state solution,” State Department spokeswoman Jen Psaki told reporters Wednesday. “But that doesn’t mean that we’ve made a decision about changing our position with respect to the UN,” she added. “The more the new government veers to the right the more likely you will see something in New York,” FP quoted an anonymous Western diplomat as saying. The magazine speculated that Washington might abstain from voting on the UN resolution condemning the construction of Israeli settlements in the West Bank, thus letting it pass. “I could see that as a possibility,” Ilan Goldenberg, former member of the Obama administration’s Mideast peace team told FP. The rift between US and Israel is more based on a clash of personalities rather than fundamental bilateral relations Eric Draitser, independent geopolitical analyst, told RT. "There has definitely been a rift that has grown in the personal relationship between Netanyahu and Obama; between the Israeli regime that he leads and the Obama administration. Part of that has to do with personalities and belligerent rhetoric that Netanyahu employed all throughout the campaign... But at the larger level this remains a personal question," Draitser said, adding that as the US moves into an election in 2016, the prospective candidates might distance themselves from Obama and move "towards a conciliatory tone with Israel and the maintenance of that special relationship." Some experts believe Netanyahu’s win in the election, despite his policies and increasing political isolation, will only encourage him to stay on such a course. "The situation politically has deteriorated in a sense that Israel is increasingly isolated. If after two years of this kind of negative results [sic] Netanyahu gains again this kind of mandate, then I think it will encourage him to continue doing exactly the same," Dr. Ishay Landa from the Open University of Israel told RT. US officials insist they would never cut military aid to Israel, nor would they support Palestinian membership in the International Criminal Court. “But they feel no similar inhibition about settlements, which they consider utterly indefensible,” liberal columnist Peter Beinart wrote in the Israeli daily Haaretz on Thursday. Another sign that the US may rethink being “Israel’s shield” was the recent appointment of former Clinton adviser Rob Malley as the White House’s point man on Israel, reports Politico. Malley had been forced to resign from the Obama campaign in 2008, after Jewish groups dubbed him an “Israel-basher” due to his contacts with Hamas, considered by Israel and the US to be a terrorist organization. Domestic politics may play a role in the White House’s calculations as well. “The worse relations between the White House and Israel get, the more Hillary can appease the American Jewish establishment by running to Obama’s right, and promising to repair the rift,” an unnamed US official told Beinart. 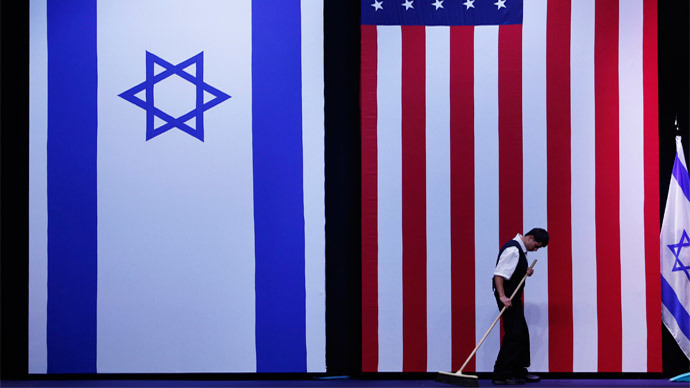 But as US enters the election cycle, the US – Israeli “fundamental relationship” is to be observed. BREAKING: Israel's Netanyahu says still committed to Palestinian statehood if circumstances improve. The White House, however, appears unwilling to let him walk back the campaign phrasing. “Words do matter,” said Earnest. Palestine isn't the only bone of contention between America and Israel - with Iran being another frequent target for Benjamin Netanyahu's condemnation. After the Israeli PM's controversial speech to US Congress earlier in March, organized with Republican lawmakers and not the White House or US State Department, Obama said his Israeli counterpart did not offer any real alternative amid the ongoing negotiations over Iran’s nuclear program. In his address, Netanyahu said a deal with Tehran would all but guarantee that Iran would have the capabilities to build nuclear weapons. He also pointed out that the Iranian "regime will always be an enemy of America," and compared it to "the Nazi regime." In his video address to the Iranian nation on Thursday, the US president hinted that relations between Iran and the international community, including the US, could "progress," should some forces not undermine the course, which Obama called an "early spring." "This year we have the best opportunity in decades to pursue a different future between our countries," Obama said, adding that "the days and weeks ahead will be critical," but both Iranians and Americans should "seize this moment." "Our diplomats and scientists are engaged in negotiations in the hopes of finding a comprehensive solution that resolves the world's concerns with Iran's nuclear program," the US president said, inferring that Netanyahu's calls to avoid deals with Tehran are likely to go unanswered. Iran and the P5+1 group, consisting of the five permanent members of the UN Security Council (Russia, China, France, Britain, and the US) plus Germany are thrashing out new agreements on Iran's nuclear program in Switzerland, with officials saying negotiations are in the final stage.